Anytime a paint booth is installed in a building, the amount of exhausted air must be a consideration. For example, a booth exhausting 13,000 cubic feet per minute installed in a building measuring 50 x50 x 15 (37,500 cubic feet), the air will change every two minutes. This produces a negative pressure condition on the building that can cause safety issues. If the building is equipped with gas-fired unit heaters, the negative pressure condition can actually pull gas from the pilot valves and put raw gas into the room. NFPA-33 addresses this with a calculation. Going back to the 13,000 cfm exhaust fan. 13,000 x 20 = 260,000 cubic feet. The room would have to be 110’ x 110’x 20’ (264,500 cubic feet). 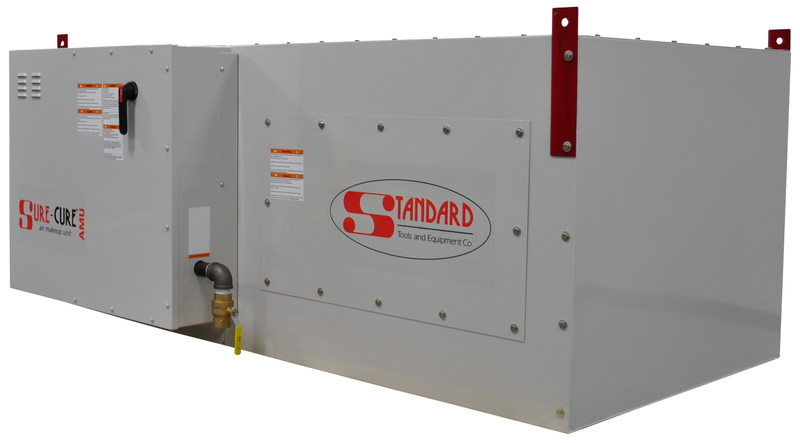 The rule of thumb is to provide the same amount of air being exhausted with some adjustment in the unit to provide the customer with the proper pressure he requires. Some may want slightly more positive pressure while some may want a neutral pressure building. Make-up air units can be placed outside or inside as long as the intake air is drawn from the outside. The control panels are mounted inside the building and can be interlocked to the paint booth to operate simultaneously. If you want more information on the Sure-Cure units from Standard Tools and Equipment, visit us online. The ductwork is simple, the discharge duct should be equipped with a diffuser to help distribute air more evenly into the room. If you have any questions, give us a call and we’ll gladly assist in determining if more makeup air is needed. 800-312-7488. Next Next post: Smiling New Paint Booth Specialist: Welcome Julie!